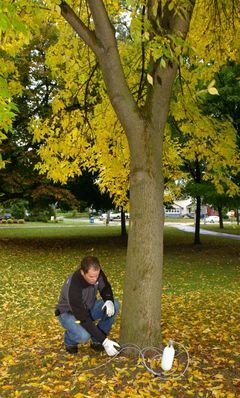 Courtesy PhotoThe emerald ash borer, an Asian pest, arrived in West Michigan in 2002. GRAND RAPIDS â Front-line battles against the Emerald Ash Borer are being waged in the city’s streets and parks. Southeast Michigan and much of central Michigan. says Dotti Clune, chairman of the city’s Urban Forestry Committee. of replacing infested ash trees with other healthy varieties. and forestry experts at Michigan State University. instead of trying to save them. chemical treatment to fight the emerald ash borer. trees in front of their homes, the city agreed to no-cut requests. about $100 by a professional. events this month to acquaint city residents with treatment options. we actually have a chance to save a significant number of them. Members of the Urban Forestry Committee members agree the city needs a battle plan, but they differ on strategy. with using insecticides on a widespread basis. and Cascade Township have been hit too hard to mount a defense. Side. Some trees are worth saving, while others are not, he said. Township and Kuyper College in Grand Rapids Township. Foerster said the new chemicals give property owners an option, depending on the size and location of ash trees. situation, I would probably want to treat it,” he said. even if it means a long-term commitment.